a shrapnel bomb was left in a car in the parking lot of my bank back in january. the short version is that it was left on a sunday night and then the police were lured there by a call reporting a disturbance (or something) BUT due to a civilian being in close proximity, whomever was meant to push the button did not push the button and instead, left. the people responsible then phoned the police and said they’d left a bomb in the area, but didn’t say exactly where (bastards). that was sunday night. the police didn’t find the car until tuesday AND THEN they found a nearby grenade trip-wired to a child’s bicycle… *sigh*. what could have happened is a very scary thought. 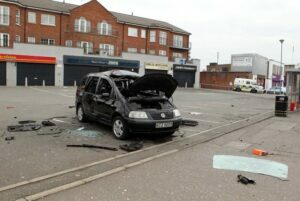 once everything was located, it was all dismantled and disposed of and whatever, and that included a controlled explosion – blowing up the car where it sat. 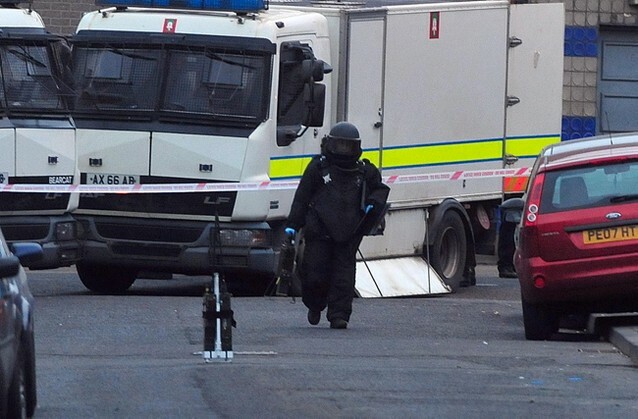 so yeah, this kind of thing actually happens on a quasi-regular basis here in belfast, and around northern ireland (you can read about the Troubles here) but this is the closest a ‘viable device’ has ever been to me (less than a mile). i must say that while this was actually happening, i was blissfully unaware and in my own safe little world here at the house. the pictures in the post are not mine, and i didn’t see any of it, not even a little bit. i was *that* far removed. This entry was posted in interesting and tagged belfast. Bookmark the permalink. Scary stuff…glad you are safe. thanks me too. i truly do feel safe here, even still. i don’t think that the stuff that goes on here is any worse than what goes on in the rest of the world, especially proportionately speaking (it’s a very small country, etc). in fact, i think it’s probably less so. you know, ultimately.